ChromeInfotech, an 8+-year-old NASSCOM recognized IoT Development Company holds a prominent name in providing premium IoT Solutions Development Services. Since the rise of IoT, ChromeInfo Technologies has embraced it to develop Smart Software Solutions to enrich Businesses, and it is now deemed as a leading IoT application development Company . As a Reputed Custom Software Application Development Company, We at ChromeInfotech have always strived to explore New technologies to adopt them and Create Innovative and customized Software Solutions. The industry of IoT(Internet Of Things) has bloomed significantly over the last couple of years. Every Leading Tech Giant has stepped their foot into IoT. Starting from IBM, Google, Microsoft, Apple to Intel, Cisco, Oracle. Name any industry giant, and I bet they will have something or other to do with IoT. These Companies have foreseen the potential that IoT holds in revolutionizing Businesses and Simplifying Human lives. 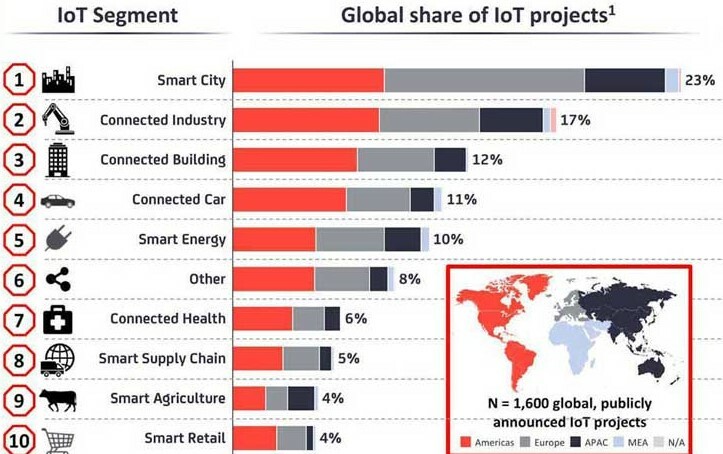 And that’s why they have been consistently Investing in Giant IoT based Projects. It is true that IoT has already made its way into various aspects of Our Lives. And the day is not far away when all of Our day-to-day activities become automated, thanks to IoT. 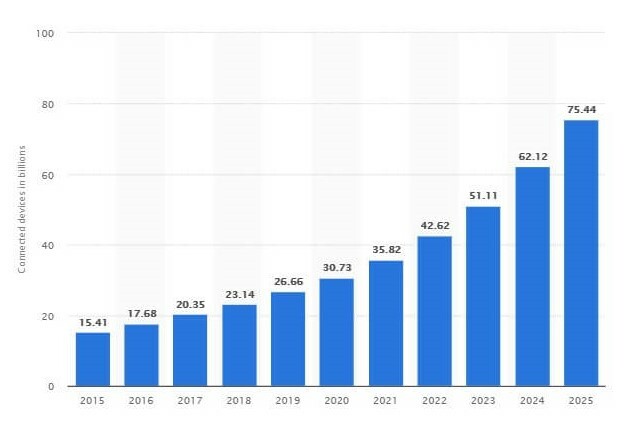 According to Statista, by 2020 there will be more than 30 billion connected devices in the world. So How do you think these devices communicate with humans or other devices? Well, the answer is through different layers of software. The devices form the Hardware which requires a software system for communication and functioning. So This is where a premium software development service provider like ChromeInfotech that is regarded as a specialist IoT Development Company comes in. Developing the software layer that allows to Transport and Displays information to the End Users. SO Continue reading below to know more about the role of IoT Application Development Company . What is IOT & What does an IOT Development Company / IOT Developer Do? When and Why to build IoT technology Solutions ? What are the steps of building IoT Applications ? What Is IoT & What We as an IoT Application Development Company Do? IoT is usually perceived to be a fancy term with a complicated computational mechanism. But Trust Me, That is not the case. But What are these “Things” you ask? Well, the things in IoT is any physical object embedded with some sensor. Your watch, your car, your doorbell to your lawn water sprinklers, literally everything and anything can be connected to the Internet. Now there a wide range of Sensors available. From temperature sensors, light sensors, motion sensors to moisture Sensors and air-quality sensors, the list is neverending. Now These sensors are what make things SMART. The sensors collect crucial information about the environment/surroundings. And then with the help of a communication channel/software, send this information over to You or other connected things. Sensors form only one component of the entire IoT Network. This includes the actual SMART Devices with one or multiple sensor chips installed in them. The data sent by the Devices need to be stored, managed and processed somewhere before reaching the users. This is carried Out by a Software application. And since IoTs deal with massive amount of data, this software or infrastructure run in the cloud. This component of the IoT Network also deals with Analyzing Data before sending it to the End Users. This is one of the essential components that allow end Users to visualize the data and information. So Where does an IoT Development Company comes into the scenario? At ChromeInfotech, Our job is to bridge the gap between a sensor and the end-user. Well, We help build the Channel through which a SMART Device can communicate any data to the end users. Our team of IoT developer provides end-to-end IoT application development services that help to efficiently and accurately Transfer information from one end to the other. One of the most critical roles of an IoT Development Company is to design the architecture of your IoT Solution. At ChromeInfotech Our Approach to IoT architecture development varies from one Project to another. We first take into account the requirements of a particular Project or Solution. And then come up with an IoT architecture that is the best fit for a Project. The perception layer which comprises of Sensors and SMART devices. 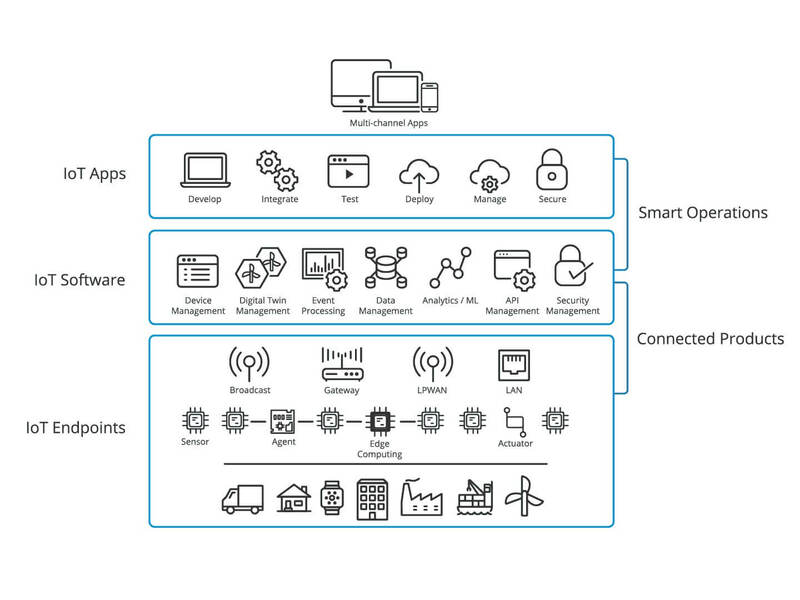 We join the dots between these layers/elements and plan out an appropriate IoT architecture to seamlessly connect one device to another. Consistent: We focus on every element or building block of the architecture to facilitate stable and smooth functioning of things. Flexible and Scalable: Ability to adapt to and incorporate new logics and functions. Easy to Integrate with already implemented IT solutions like ERP, WMS and more. 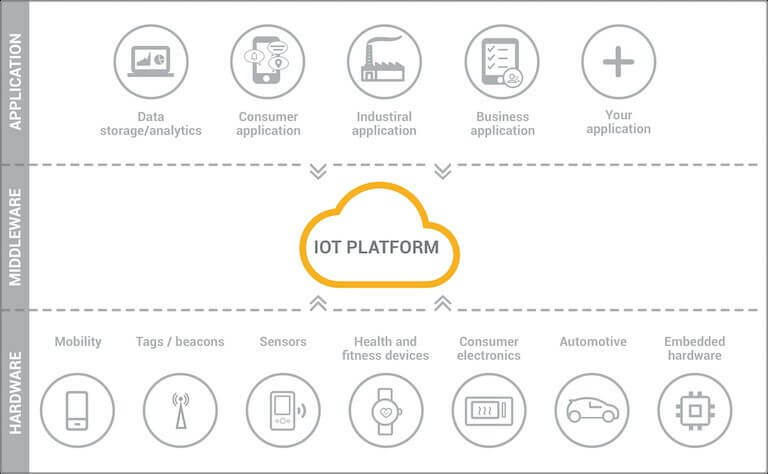 An IoT Platform acts as the middleware that connects the hardware(sensors) to the User applications. It comprises the middle layer that manages all the communication that takes place between them. And Since IoTs draw in massive amounts of Data, So most of the IoT Platforms are Cloud-based. Now These IoT cloud Platforms are crucial tools for every IoT development company . An internet of things development company usually uses them for data storage and data analytics. Analyzing data collected by the devices. Now there are many parameters and practices to pick the right IoT Platform for your Project. But Selecting a Platform depends upon the requirements of your Project. ChromeInfotech houses a team of proficient internet of things developer with knowledge and expertise in various IoT Cloud Platforms. Our responsibilities as an IoT app development company doesn’t end at just building IoT applications. We also focus on providing extensive Support and Maintenance services to each one of Our IoT technology solutions. Post-launch, We provide L1/L2/L3 Support and technical assistance to deliver a satisfactory Customer Experience. Also, We make use of the latest tools and techniques to provide timely maintenance to Our internet of things IoT solutions. Now There’s one more thing that we carry Out to ensure that your IoT Solution is working perfectly fine and is helping grow your Business. And that is integrating your IoT application with an app analytics tool as per requirement. As a reputed IoT development company , We strive to make sure that Our Clients don’t fall victim to any technical issues. As one of the top IoT development companies, We also provide IoT consultancy services whenever required. We help Clients clear out their confusions and guide them in taking the first step towards their IoT journey. Now Internet of things application development may sound complicated and raise questions in your mind. Provide you with proper information and assist you in embarking on the path of IoT app development. Evaluate the needs and benefits of adopting IoT Solutions into your Business model. Data is what fuels the functioning of Business Organizations and Enterprises. Then We as an IoT software development company can help you with that. We focus on integrating it to the already existing and owned Data. Integrating New IoT Solutions into your Business Models and Environment. We have the resources and expertise to integrate your existing Business systems with your internet of things mobile applications. ChromeInfotech is a top-rated Mobile Application Development Company and Hence holds experiences and proficiency in building user-centric Applications. Hence We can deliver an IoT Application that is 100% quality oriented and which is also user-friendly. Our mantra is to come up with Simple but Smart designs which result in a visually appealing UI and a seamless UX. We strive to shape up Applications that can provide users the data recorded by the sensors in the most efficient and presentable manner. Anything connected to the internet is vulnerable to online attacks and security risks. So, as one of the top IoT development companies, We hold IoT Application security as Our top most Priority. Therefore, We adopt the best Security Practices to prevent Online threats to the IoT technology solutions developed by Us. We implement various CyberSecurity measures to make sure that no unauthorized User can access private and sensitive information. These are the services that you can have access to with ChromeInfotech as your IOT technology Partner. But Our Services are not restricted to just the above. We also provide services related to blockchain development and can use blockchain technology to build a superior quality IOT Solution. Blockchain empowered IOT Solutions are much safer and secure. And hence the perfect technology for your business. IoT is such a technology that can be beneficial and the right fit for any industry vertical. With an IoT Application development company by your side, your Application will surely stand Out of the crowd. Now There are a countless number of IoT app development Use cases. And this is the driving reason behind Why people still don’t have a clear understanding of IoT. Ask any internet of things development company, and they will point out a zillion practical implementation of IoT technology. But as with all cases, certain sectors top the list as the most popular IoT segments. The impact that IoT had on Our homes clearly cannot be ignored. Starting from Smart door locks, appliances, lighting to environmental controls, all these have automated Our day-to-day activities. Thus, making Our lives much more comfortable and more straightforward. And As one of the top internet of things companies, We often work with IoT Projects belonging to this segment. But Our complete IoT development services are not only limited to Businesses aiming at easing the lives of existing Home Owners. We as an IoT application development company have also been transforming the real-estate sector. We achieve this by delivering unique Smart Home/Building related IoT Solutions. And One such solution is the innovative Home tour Solution Application. Facilitates potential home buyers/tenants to view property without the assistance or presence of a realtor. Furthermore, This Application turned out to be a huge success and has gained a vast userbase since its release. Read the full case study here to know more about this Project. So Are you envisioning the development of similar IoT Solution? At ChromeInfotech you can Find the best Internet of Things (IoT) app developer for your Project. It is one of the industry segment that significantly benefited from the rise of IoT. And Some of the leading companies using internet of things belong to this sector. IoT application development companies like Us develop Software that ranges from Car GPS system to ones that support high-end self-driven Cars. At ChromeInfotech, We have delivered various IoT Solutions that are related to the Automobile Industry in some way or the other. 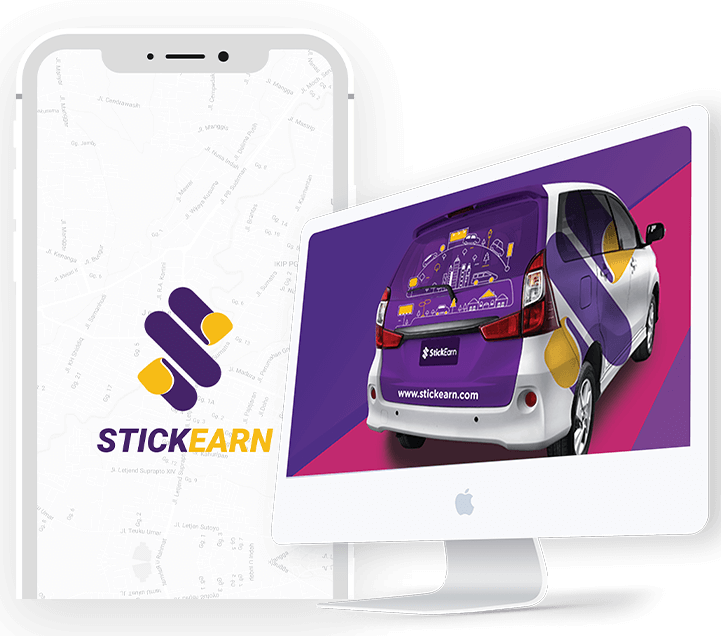 And One such Project was the development of an Application that facilitates the use of cars as an advertising Platform. The Project required Us to come up with a Solution to continually keep track of the vehicle or the car. So we connected the App to a sophisticated IoT technology called BEACONS that were embedded in the advertisement sticker. Every IoT service provider company believes that the Healthcare sector can take a giant leap with IoT by its side. Entrepreneurs are flooding up the market with innovative internet of things healthcare applications. So that’s Why We look out to embrace IoT internet of things application development Projects that can improve a patient’s quality of life. These projects mainly include the development of Software for Wearables. Now These are devices that monitor heart rate, sleep, daily activities, and other health-related metrics. We then develop an App that displays the recorded health vitals and can share them with a person’s healthcare provider. However, This is just a basic example of the internet of things healthcare applications. There are more sophisticated Solutions that are revolutionizing this sector. Then an IoT Application development company is where you should head to. There are many ways How IoT is impacting the Agriculture Industry in today’s world. Leading IoT application development companies are shaping up Solutions that are facilitating: Increased agricultural production with a lower cost. Our IoT application development services involve building software that helps monitor the well-being and location of livestock such as cattle. In these Projects, Animals are embedded with wireless trackers. And We connect these to the software that We develop. Hence, by using this software one can track the whereabouts and the health of their livestock. Users can track this information using the software and then take the necessary actions. Moreover, These sensors can also be connected to other devices which can automate various farming activities. Now At ChromeInfotech, We build Software systems that are connected to specific sensors such as SMART tags or trackers. We build software with powerful User Interface that presents reliable and real-time information to the Business owners or Manufacturers. Then We, as one of the biggest internet of things companies can be the Answer to our requirement. Build a Business Based IoT Solution: When & Why? The total spending on IoT in the year 2019 is forecasted to be a whopping $745 billion. An increase of 15.4% from 2018. And it seems that the growth of these numbers won’t be stopping soon. This is because IoT solutions are fueling Business Transformations like never before. Then adopting an IoT solution in your business environment is the right thing to do. And We as an IoT Application development Company believe that IoT Solutions can have a massive impact on How you do Business. There is, in fact, a subset of IoT known as IIoT (Industrial IoT). And it is dedicated to the implementation of IoT Solutions to enhance Industrial and Manufacturing processes. ChromeInfotech is also one of the top industrial internet of things companies that have been enriching Businesses with customized IoT solutions. Every task that is carried out in an industry can be automated and efficiently monitored, tracked and managed with an IIoT Solution. Then industrial Internet of things Companies like ChromeInfotech should be your destination. The rise in the era of IoT has opened up a whole lot of opportunities for new probable Business lines and ideas. Now An IoT application development Company can turn any idea into a Magnificient and successful IoT Solution. To help tackle everyday problems and satisfy the needs of Users. So All IoT Solutions simplify and ease out human lives by automating everyday tasks and providing a personalized experience. IoT has opened up doors for Entrepreneurs to come up with new innovative ideas for Application Development. This is the right time to approach IoT Application Development Company and build a Customer experience enhancing IoT Solution. Below, I have discussed some Businesses that have established themselves with innovative IoT Solutions. The uprise in IoT technology has sparked new Business Opportunities. It is leading to the emergence of many innovative Solutions that are changing the conventional norms. At the Moment there are numerous Business Ventures that are making it big in the Market. With their IoT Solutions. And you can achieve this too! So Just Sit down for a while. Research and define the industry segment or IoT Use case that you want to target. And approach a recognized and top-rated IoT Application Development Company like ChromeInfotech. We will help you realize your dream of building a successful IoT Solution with Our remarkable IoT development Services. Nest, founded in 2010 is a leading IoT Company involved in the development of SMART devices for efficient home management. All these connected devices can be monitored and managed through a dedicated App. These type of Applications are widespread among top IoT companies including ChromeInfotech. MyMDBand is an IoT empowered wearable that is useful in medical emergencies. It is a unique IoT Solution. The device, which is a band provides health information about the user. So In case of any medical emergency, the band uses GPS to track the location and then provide the information in the local language. It contains a QR code which one can scan and get all the health information about the User. Skybell is an award-winning SMART video doorbell. 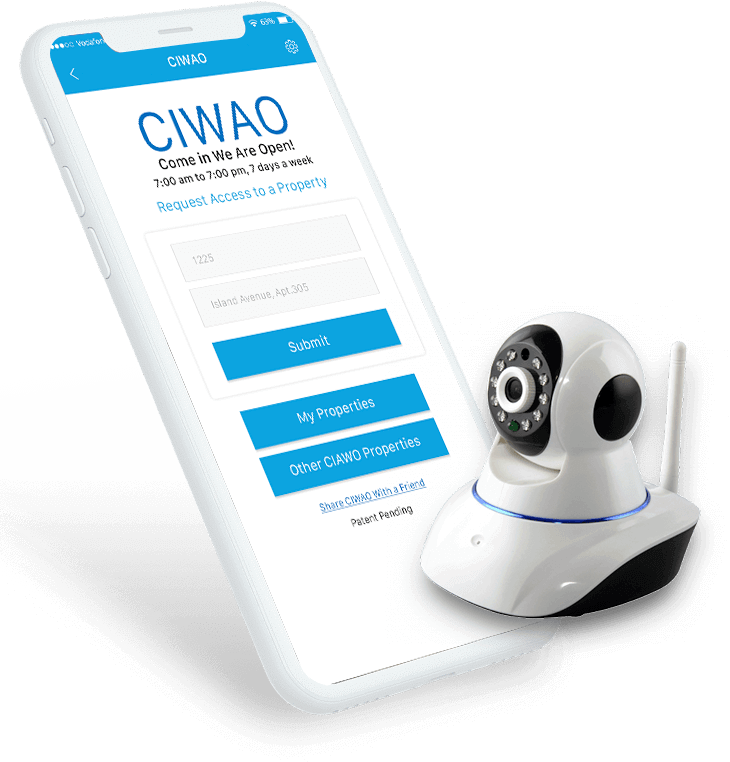 It connects to an App and sends live HD video allowing Users to see, hear and speak to visitors if when not at home. This IoT Solution is equipped with a motion sensor and alerts you about visitors even if they don’t press your doorbell. And It also provides full-color night vision. Blossom is yet another IoT Solution that is transforming the landscape of Home Gardening. It is a SMART watering system. So what it does is that It gathers real-time weather data and creates a watering schedule for your garden or yard. The device connects to a mobile App using which Users can easily monitor and manage it. Moreover, The App is also connected to automatic water Sprinkles which Users can control with just a tap on the phone. Although this solution is only restricted to home gardens and lawns, similar IoT Solutions can also be developed for large scale farming and agriculture. As an IoT Application Development Company , We think that June is one of the most innovative SMART Home oriented IoT Solution. This company offers a one-of-a-kind SMART Oven that automates even cooking. It is fitted with cameras and sensors and offers suggestions to cook your food. And then The Oven is connected to an app using which you can track the cooking process from your phone. You can also alter the cooking settings if required with just a tap on your phone. So these examples are just a glimpse into the endless possibilities of developing innovative IoT Solutions. And Our responsibility as an IoT Application development company is mostly centered around developing the Software. It is also Our job to integrate these components to form a complete IoT Solution properly. Check Out this write up on top IoT Companies and innovative IoT Products to get more perspective and inspiration. As an established IoT development company , We at ChromeInfotech want to point out the truth that IoT App Development is no child’s play. It is unlike the development of any conventional software and can be quite challenging. That’s because a full-fledged IoT Solution is a combination of various ingredients including both Hardware and software. So the steps to IoT Application Development is remarkably complex than normal Application development. Our approach to IoT development depends upon the Project in question. Moreover, Each Project is different. Hence We employ strategies that are tailored to meet the requirements of a particular Project. The very first action that We at chromeInfotech take is to sit down with Our Clients and get to understand the Project. This is the phase which lays down the foundation for the future strategies of the Project. ChromeInfotech is a recognized Custom Software Application Development Company specializing in IoT Application Development. And We have delivered digital Solutions to over 23+ Industry segments. We have the experience and the potential to deeply understand as well as analyze your IoT based Business Project. The IoT Application is nothing but the visualization layer. So, It allows End-users to view information collected by the sensors and also interact with the SMART devices. And We at ChromeInfotech put in all Our efforts to shape up an engaging and intuitive User Interface/User experience. Moreover, We house a team of dedicated React native developer who are experts in developing Mobile Applications With beautiful User Interfaces. Hardware selection is one of the most crucial steps. And As an IoT Application Development Company , Our job is to strategically figure Out the perfect Hardware or device for your Project. There are thousands of options out there in the Market. Possesses the capabilities required by your Project which may include- GPS, audio, video, waterproof, etc. Recognized and certified by regulatory boards relevant to your Business. The next phase that We go through is to select the best communication channel. Now What we do is first figure out the mediums that are supported by the selected devices. And The options may range from Bluetooth, WAN, LAN to Wi-fi and any other satellite communication. As an IoT Application Development Company , We believe that this is one of the most significant steps of the whole Process. And Depending on your requirements, We either go with selecting an already available IoT Cloud Platform or build a customized one especially to meet your needs. The capabilities and limitations of every Platform are different. So We extensively evaluate the various Cloud IoT Platforms and choose one that is the best fit for your Project. We, as one of the top IoT Application development Company , understand the importance of this particular step. So We strategize ways to integrate all the hardware and software components in a feasible manner . We adopt approaches that effectively bridges the gap between all the components. Also, we ensure that all the components are working well individually as well as in a connected environment. It is essential that an IoT development Company focuses on this step to ensure smooth coordination and proper functioning of the complete IoT Solutions. These steps represent just an outline of the complex process that We as one of the biggest internet of things companies carry Out. In realitry, It takes a lot of dedications and steps that add up to form the final and complete Solution. Looking at the steep increase in the number of IoT devices, there is no doubt that the future of IoT Application Development seems very promising. From Smart Homes to Smart retail stores, every aspect of Our future will be connected. So this is the perfect time to step your foot into IoT and associate with an IoT Application Development Company as a Tech partner. You can Find the best Internet of Things (IoT) app developer at ChroemInfotech. Hence, If you have an idea and want to be a part of this revolutionary technological advancement, then Please do drop in your requirements at ChromeInfo Technologies. IOT Solutions provide Users and Businesses the power to better control things and manage daily tasks. Hence, making them feel more connected with the World and the environment around them. It provides a New way of handling everyday problems, leading to a superior quality of life. And this is something that every User looks for in any form of digital Solution. This is what makes any IoT Solution a hit among Users! Building an IOT Solution in today’s date can be one of the most beneficial Business Venture for Entrepreneurs like yourself. So have you started Looking for the top internet of things technology companies? We would love to get your feedback on the Blog in the comment Section below.